De Poezenboot will hold a special place in the hearts of animal lovers as it is a picturesque sanctuary for stray animals. The cat boat is a one of a kind place that actually takes care of cats while floating. 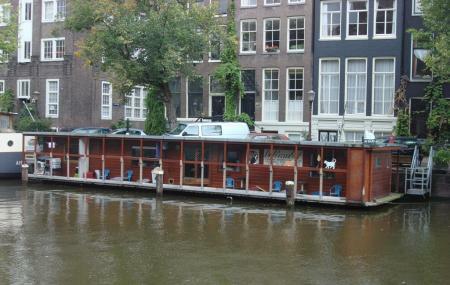 It is the only sanctuary that floats and is a refuge for stray and abandoned cats. Visit the destination as it comes highly recommended by travelers and if you are someone who loves cats then this place has to be on your bucket list. Take a tram or bus from Amsterdam, NieuwezijdsKolk. How popular is De Poezenboot? People normally club together Amsterdam Centraal Railway Station and Anne Frank House while planning their visit to De Poezenboot. Love cats? This is a must see! Free entry (but you should leave a donation). You don't get long inside (we stayed for about 15 minutes) as it's quite popular and there is always a queue. Was amazing! Well worth a visit if you like cats and please leave a donation so they can continue their work! Check the website as they are only open for a couple of hours a day and you may have to queue as they don't like to overload the cats with too many visitors. A lot of fun. Just be aware there may be a little wait. They only let a few people in at a time with the cats which of course makes sense. A novelty stop in Amsterdam. The boat house has a small gift shop and the main area where the cats live. It was fun attempting to play with the cats although many where aloof. I also disliked the amount of treats the cats where given - the lady would throw large amounts treats across the floor to make the cats run around, which I don't think was very healthy for the cats (she did this every minute or so).